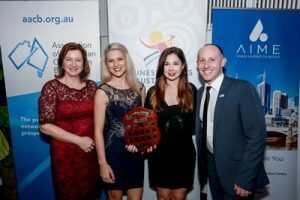 The Association of Australian Convention Bureaux (AACB) is pleased to announce Business Events Cairns & Great Barrier Reef (BEC&GBR) as the winner of the AACB’s Innovation Award for 2015/16. The award was announced at the AACB Annual Conference gala dinner held at Victoria Park, Brisbane on 9 September. During the qualifying period, BEC&GBR introduced a program for members to lift the level of business events professionalism within the region and establish a standard for consistency in response to local challenges. Simpleview, which provides cutting-edge technology and marketing solutions for destination marketing organisations, sponsored the AACB Innovation Award for the first time this year. “We’re proud to be a part of recognising the impressive economic and service contributions of convention bureaux to business promotion in Australia and beyond,” he added. The award recognises new innovations which represent a significant transformation to bureau operations, technology and/or to the product pipeline. Bureaux competing for the award gave a TEDx style presentation at the 27th AACB Annual Conference where voting was conducted by a combination of scores from competitor bureaux and independent judges. Each entrant highlighted specific benefits and organisational gains which have been realised from the innovation implemented and the impact it has had on the business events industry and wider community.